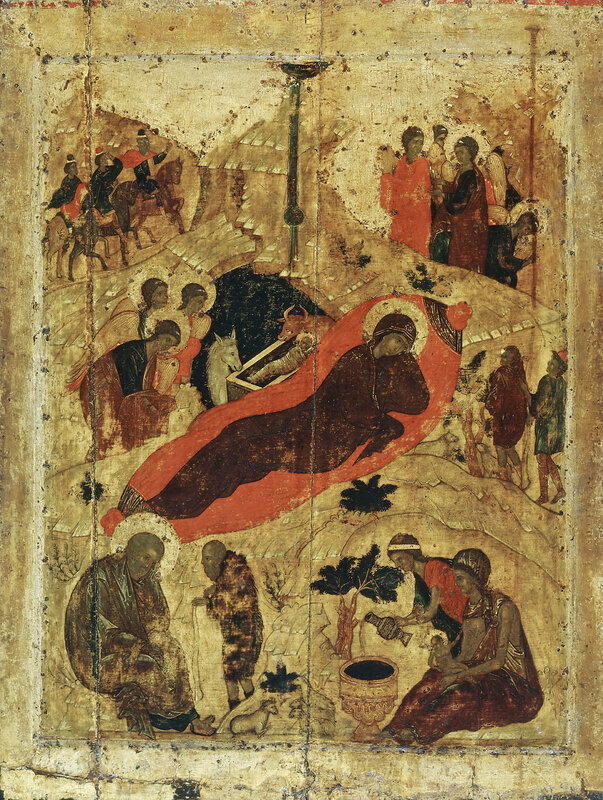 Our painting today is by Andrei Rublev whose Icons and Frescos are supreme works of devotional art. Herbert Howells music has an English reticence which belies the oceanic depths of feeling it can summon from the listener. His, ‘A Spotless Rose’ especially when sung with the aching purity of The New College Oxford Choir tenderly ushers the cosmic into our mortal consciousness. Today I think it’s time to remember that Christmas is a time for celebration. A time to meet up with old friends and make new ones. A time to sing and dance and laugh. A time to shake our fists in the face of the dark, cruel winter as we affirm our faith in the inevitable restorative power of the light. For many years I did much of my celebrating in bars, pubs, Honky Tonks and Road Houses soaking up the music and the booze as the nights progressed. The music choices today reflect that biblious spirit. First, the Boss Of The Blues – Big Joe Turner. Big is no empty boast; Joe was over 6ft 2 and weighed more than 300 pounds so when he arrived in a room you knew he was there! You would also know Joe was around because his voice could break through walls and wake the dead. Joe had to develop his shouting style when he worked in the hectic, heaving bars of wide-open Kansas City in the 1920s and early 1930s. Even though the joints Joe worked in such as the Kingfish and the Sunset would have been rammed to the doors with free spending, free fighting customers Joe never had any problem getting heard from behind the bar. As, ‘The Singing Barman’ he formed a famous partnership with pianist Pete Johnson immortalised in the standard, ‘Roll ‘Em Pete’. If I had been a customer I would have ordered (in honour of the Rudy Toombes song) One Scotch, One Bourbon, One Beer – knocked them back and settled in for a night of peerless blues. Joe’s career lasted some 60 years and he was variously styled as a bluesman, a jazz singer, a Rythmn and Blues stylist and a pioneer rock ‘n’ roller – whatever the label the big man went his own sweet way launching every song into the stratosphere with the immense power of his vocals. From the moment, ‘Christmas Date Boogie’ opens we know we are in good hands. Big Joe is very much the master of ceremonies marshalling the instrumental forces around him. They are all fine players given their chance to shine but there is no doubt who is the star of the show! You can just imagine the big beaming smile of Joe as he tears into this Christmas frolic. Resistance is useless – where’s the Bourbon? THE SHOOK, THE SHAKE, THE SHEIKH OF ARABY’. The subject of the poem and the artist featured in our second music selection is, of course, the one and only, one man musical encyclopedia and indefatigable party starter: Thomas ‘Fats’ Waller. A short list of his accomplishments would have to include his very considerable prowess as a pianist, organist, singer, songwriter, composer and comedian. Yet any list of talents and achievements would undersell Fats impact on his contemporary artists and his audiences. Fats was beyond category – he was Fats Waller and The Lord of any room he chose to light up. He could in the course of a single number go from being rollickingly rumbustious to wistful gentle melancholy. Sadly his early death meant that the true depth of his talents were never fully sounded but nevertheless he leaves a unique legacy of wondrously entertaining recordings. If you ever need cheering up and reminding of how good it is to be alive just press the button next to Fats name and you will feel a whole lot better – I guarantee it. Today’s poem is, ‘Mary’s Song’ by Charles Causley. This entry was posted in 1940s, 1950s, Choral Music, Christmas, Classical Music, Jazz, Music, Rhythm and Blues and tagged A Spotless Rose, Andrei Rublev, Big Joe Turner, Charles Causley, Christmas Date Boogie, Fats Waller, Herbert Howells, Swingin Jingle Bells by Thom Hickey. Bookmark the permalink. I need to investigate that Russian Orthodox tradition Thom! Great songs and I also followed the Fats Waller (mmm those twinkling piano keys) link to an amazing blues song by a 1920’s lady called Victoria Spivey – never heard of her before but please cue her up on the Jukebox ? Yes, there is something profound in Russian art. Victoria Spivey? Sure to feature here .. Interesting figure and crops up in the very early days of the Bob Dylan fable. Ha! Thanks very much. Best wishes for the season. Thom. Thanks. Have really enjoyed setting up the range of artists and styles featured in the 2016 Cornucopia.